Lightest and most flexible, foldable snake gaiter on the market! Protect yourself against snake bite while in the desert or woods! Rattlesnakes (as well cottonmouths, copperheads, and other poisonous vipers) possess a set of fangs with which they can inject large quantities of toxic venom. The venom travels through the bloodstream, destroying tissue and causing swelling, internal bleeding, and intense pain. Even non-fatal bites can cause severe pain and long-lasting tissue damage. Don't take a chance! Protect your lower legs whenever you're in snake country! TurtleSkin SnakeArmor Snake Gaiters are constructed from a super-tight patented weave of high-strength ballistic fibers and polyester. 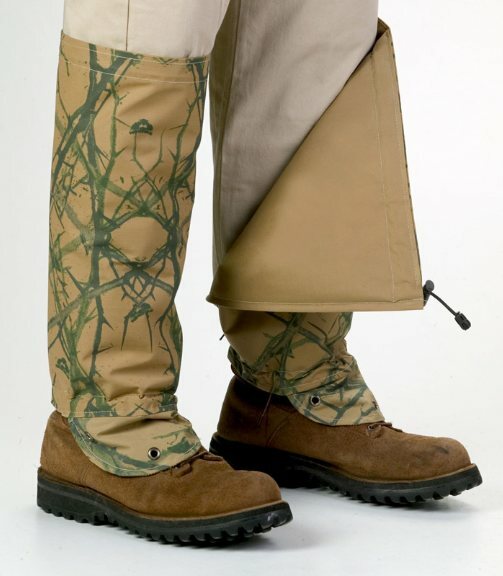 Most snake gaiters are heavy, stiff, and bulky and feel too hot to wear in the summer months -- but not this brand! Weighing less than 6 ounces each, these gaiters are one-third the weight of other snake gaiters, yet are tested to repel even large snakes. Made in USA. SnakeArmor gaiters are also windproof, waterproof, and flexible. Simply close up the back and cinch the elastic top for a snug fit on your calves. If you're trekking through "Snake Country" consider TurtleSkin brand is the best and most comfortable snake protection. Most snake gaiters on the market are not foldable, however if you are backpacking or want to save storage space, you'll appreciate that the Turtleskin SnakeArmor brand folds to approx. 8 x 8 x 2 inches. Choose from 4 color options in drop down menu. Grommets: On the top of the foot are three grommets (2 grommets on the sides and 1 placed in the center) which are designed to run a separate boot lace through and tie down the gaiters to prevent them from riding up. It is not necessary, but if you prefer, take a boot lace and run it under the arch of the foot through the side grommets and tie the lace at the top of the foot area. Zippers: On the off chance a zipper ever sticks and has trouble zipping up (can be caused by sand, dirt, and heavy brush getting caught in the zipper teeth), lubricate the zipper with soap or even beeswax and the zipper will easily slide up and down. The manufacturer warranties that all TurtleSkin products will be free from material and workmanship defects for 1 year and the buyer’s remedy is limited to the repair or replacement of nonconforming product (at manufacturer’s discretion). Warranty does not cover excessive wear or damage caused by the user. Want to ship this item outside of the USA? Click here to for international orders of regular size gaiters.